NOTE: These are brand new reproductions of the original Sun 78 rpm. Labels pressed from original Sun label molds. With the 40th Anniversary of Elvis' passing comes a special release. This is the first time since Elvis Sun replicas produced in the 1970's, that have been made to play the original 78RPM speed. Since then some were only made at 45rpm. Each of the 5 Sun replicas have the original etched numbers included with the appropriate song sides and are by far the most original Sun replicas made. All the labels are perfect (as the original) in size, accuracy, and color. The sound quality is excellent with the original Sun sound recordings (including That's All Right) and is pressed on heavy stock vinyl. This is a strictly low limited number release and an extra low limited number release of a CRYSTAL-CLEAR version in a clear polybag. A first time ever in this version for any Elvis Sun single replica produced. Available in true all Crystal-clear vinyl. 1 That's All Right / Blue Moon of Kentucky. 2 Good Rockin' Tonight / I Don't Care If The Sun Don't Shine. 3 Milkcow Blues Boogie / You're A Heartbreaker. 4 Baby Let's Play House / I'm Left, You're Right, She's Gone. 5 I Forgot To Remember To Forget / Mystery Train. 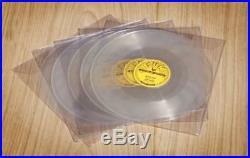 The item "Elvis Presley 5-78 rpm Sun Clear Vinyl Records. Mint" is in sale since Thursday, May 17, 2018. This item is in the category "Entertainment Memorabilia\Music Memorabilia\Rock & Pop\Artists P\Presley, Elvis\Music". The seller is "1cooldj" and is located in Decatur, Illinois. This item can be shipped worldwide.